Today’s episode is a unique opportunity to hear from someone who has already been there, and done that – Lisa’s Grandma Venetta. 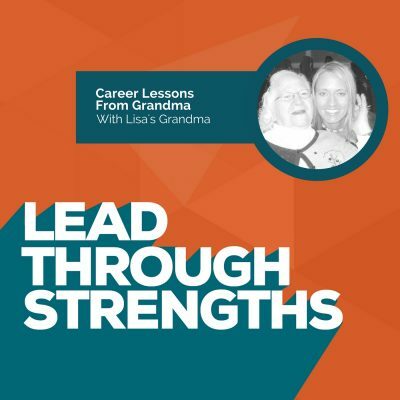 Lisa interviews her Grandma to get valuable insight into better ways to value your own life experiences, use your own strengths, and see the good in others. In my opinion, this is one of the best podcast interviews yet, because it includes real-life lessons that you can immediately apply to your own life. There are five lessons you will learn in this episode, and they can be applied to both your home and work lives. Show respect for everyone, regardless of their title or position. Be a bridge builder between the various people at your company. Listen to what employees and managers are saying, and help bridge the gap between them. Remember that relationships are important, even when you are busy. Treat people like they want to be treated. Treat people like they matter. Stop taking yourself so seriously. One of our favorite companies here in Austin, Texas is Kasasa. They have some great examples in this video about humanizing the workplace. They have a good time, and it helps people get more done because they live out their values and respect each other. These are not pedestrian kumbaya games. They have a wooden spoon challenge and a hula hoop competition that I’d like to join, even though I don’t work there. Be on the lookout for your unique skills and talents. Notice what works for you and leverage the heck out of it. You’ll have more moments of success and high energy. Help your team members do the same. Recognize someone on your team for something. It could create that moment that they’ll remember for the next 50 years, just as Grandma Venetta remembers the moment she was declared the “Fastest Zipper Sewer” in the Midwest. Create fun, unique titles and awards for your team, such as “Fastest Zipper Sewer”. It doesn’t have to be fancy or expensive. In another awesome Kasasa video, you can see how they give recognition for employees showing their badassitude and living out their other “Patch” values. Grandma Venetta’s family moved an uncle into their home. He had cancer, and they moved him in, even when they thought it was contagious, because that was the kind thing to do. You should do anything you can for your friends and neighbors (and co-workers too). Find what your “Cancer is Contagious” kindness factor is. Here are some ideas: smile first thing in the morning, even when you’re tired; hold the door for others, even though it will delay you by a whole 14 seconds; volunteer to call the customer with difficult news because you are the one with the best relationship, even if it’s not your job. These are moments when you can be proud of yourself. Your values and expectations are all shown through your actions. Remember that people are always watching you, so they will know who you are, what you value, and what you expect from others. Everything you do shows them how to interact with you, and what you expect from the culture at work. Remember these things when you walk through the door in a bad mood. Here are some ideas from Mike Michalowicz. It’s 101 ideas for recognizing people at work, without giving them money. This is a great way to model what you want to see from the world: more noticing what works so you can get more of what works. Grandma Venetta accidentally ran over herself with her own car, but that didn’t stop her from driving. She only stopped when she was afraid of hurting others. Rather than feeling sorry for herself about the medical issues, she finds amusement in the absurdity. She quickly moved to the gratefulness for the lack of serious medical issues. Even though Grandma Venetta is unable to drive now, and has to ask family to take her places, she still feels lucky to be alive, and to have family who loves her and is willing to care for her. Even though she still hates asking for help and feeling like a burden, she chooses to focus on feeling lucky for being loved. Look for the good in things, even when you are stressed at work and feeling overwhelmed. Step back, get some perspective, and find some good in what you do. This will help you feel lucky and happy for what you do have. Grandma Venetta says to live every day like it’s your last. Your life is always going to have its ups and downs, but if you focus on the good parts, it makes it much easier to deal with the challenges. That concept is in perfect alignment with what we teach in StrengthsFinder training events. It’s about finding your personal yearnings and natural talents so you can build a life that feels rewarding and energizing. If you spend a lifetime taking jobs that impress other people, you might just look up in your 80’s and realize that you didn’t impress yourself at all. Remember, using your strengths every day at work makes you a stronger performer. If you place a lopsided focused on fixing your team’s weaknesses, you’re choosing the path of most resistance. Go claim your talents and share them with the world!